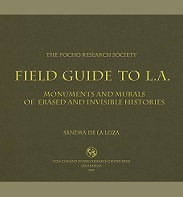 The Pocho Research Society Field Guide to L.A. Visual and performance artist Sandra de la Loza presents a wry commentary on the Chicano history of Los Angeles in this field guide to Downtown and East Los Angeles. Using the format of the photographic essay, she documents the exploits of the Pocho Research Society, an organization dedicated to commemorating sites in Los Angeles that are of importance to the Chicano community but that have been erased by urban development or neglect. By drawing attention to invisible monuments and lost histories, de la Loza asks her readers to consider the broader question of what constitutes a community’s history. "Ms. De la Loza's book is nicely done . . . There is a touch of anarchy to the whole thing, since those who go about by night sticking their own plaques above the official L.A. bronze do tend to be secretive."